The internationally renowned early music ensemble Passamezzo performed Music, words & song from Shakespeare’s England on Wednesday 25th July, 2018 in support of the children’s cancer charity CLIC Sargent at the 5th in a series of annual charity musical evenings organised by the Worsted Weavers Guild. The performance was held in St James’ Church on the Packington Estate in Warwickshire (~ 20 minutes north of Kenilworth), by generous permission of Lord and Lady Guernsey. The concert was followed by a reception in the Pompeiian Room and on the terrace of Packington Hall. The Capability Brown designed grounds and the Diocletian-era inspired church on the Packington Estate are not normally open to the public. Passamezzowas founded by Tamsin Lewis in 2001, initially to explore the Jacobean Masque. A passamezzo was a popular sixteenth century tune and dance. It could be played and danced simply and enjoyed by anyone, but could also become an exhibition piece, with virtuosic and showy divisions played upon it. The core membership of the ensemble has expanded to: Eleanor Cramer (soprano), Alison Kinder (viols and recorders), Tamsin Lewis (Renaissance violin, viols, voice), Richard Mackenzie and Robin Jeffrey (plucked strings), Richard De Winter and Michael Palmer (actors and baritones), and Charlotte Ewart (choreographer) . The ensemble specialise in English Elizabethan and Jacobean repertoire, the masque remaining an important part of their programming, and concerts have a distinct theatrical air created by costume, readings and presentation. The ensemble delights in all aspects of musical life, from the intimacy of the lute song, to the brash raucousness of the broadside ballad, from the sacred part song, to the profane insanity of bedlamite mad songs. The programmes are carefully researched with music frequently taken from manuscript sources, unearthing pieces that have lain hidden for centuries. It is this range of material and overall spectacle, combined with the informative and accessible manner of their presentation, that makes Passamezzo such an engaging group. Passamezzo often work with dancers and actors. They have played in a great variety of venues including the British Museum; the Victoria and Albert Museum; Shakespeare’s Globe Theatre; Hampton Court Palace and in theatres, concert halls, stately homes, churches, palaces and ruins throughout England. Television and Radio credits include: BBC Restoration; Howard Goodall’s The Truth about Carols (BBC2); Elizabeth I’s Secret Agents (BBC2); Henry VIII and his six wives, and Elizabeth I (Channel 5); Frost Fair; King Lear and Boxing Day, (Radio 4); Early Music for the Holidays; Christmas Carols, Chant and Legend (Harmonia Early Music/PRX). This entry was posted in cancer, Charity event, history on August 1, 2018 by worstedweavers. The internationally renowned Passamezzo are to perform Music, words & song from Shakespeare’s England on Wednesday 25th July, 2018 in support of the children’s cancer charity CLIC Sargent at the 5th in a series of annual charity musical evenings organised by the Worsted Weavers Guild. Passamezzo perform historical music, dance and spectacle for all occasions, specialising in the Elizabethan and Jacobean masque. The performance will be in St James’ Church on the Packington Estate in Warwickshire (~ 20 minutes north of Kenilworth), by generous permission of Lord and Lady Aylesford. Packington Hall and its Pompeiian Room, the Capability Brown designed grounds and the Diocletian-era inspired church are not normally open to the public. More about St James’ Church, the Pompeiian Room and Capability Brown. The performance will be followed by a reception on the Packington Hall Terrace with wine/soft drinks and canapés. Tickets for the concert and the reception are £35 per person. Passamezzo was founded by Tamsin Lewis in 2001, initially to explore the Jacobean Masque. A passamezzo was a popular sixteenth century tune and dance. It could be played and danced simply and enjoyed by anyone, but could also become an exhibition piece, with virtuosic and showy divisions played upon it. This entry was posted in Uncategorized on May 16, 2018 by worstedweavers. The internationally renowned Coull Quartet performed works by Brahms and Ravel on Thursday 21st September, 2017 in support of the children’s cancer charity CLIC Sargent at the 4th in a series of annual charity musical evenings organised by the Worsted Weavers Guild. The performance was held in St James’ Church on the Packington Estate in Warwickshire by generous permission of Lord and Lady Aylesford. Packington Hall and its Pompeiian Room, the Capability Brown designed grounds and the Diocletian-era inspired church are not normally open to the public. The performance was followed by a reception in the Pompeiian Room at Packington Hall. Brahms once remarked ‘It is not hard to compose, but what is fabulously hard is to leave the superfluous notes under the table’. He was famously self-critical, destroying some twenty quartets before arriving at what he was prepared to call his ‘first’ quartet, and even then he spent almost twenty years revising and polishing it before allowing it to be published. His First Symphony did not appear until 1876, when he was 43; he was painfully aware that any composer writing in these genres would be judged by the monumental standards set by Beethoven a few decades earlier. The principal theme of the first movement, a huntsman-like motif in 6/8 time, is matched by an equally rustic second subject in 2/4 time. In the development much play is made of these two conflicting rhythms, while the coda carries this Brahmsian concept to the extreme with alternating 6/8,3/4 and 2/4 rhythms neatly juxtaposed. The Andante is in ternary form, and features a warmly romantic melody, which is interrupted briefly by dramatic chordal outbursts. The ending of this movement is a moment of classical beauty, skilfully built around the first four notes of the main theme. The viola takes the lead in both the Agitato scherzo and its trio, a waltzing intermezzo of gentle demeanour, with the muted accompanying instruments providing an off-beat lilt. Biographer Karl Geiringer considers the fourth movement to be the quartet’s centre of gravity. It is a set of eight imaginative variations on a short, poised theme. In the final variation Brahms combines this theme with the opening, huntsman-like theme of the first movement, and, as Geiringer points out, ‘leads this joyous movement to its climax’. Debussy’s Quartet, written nearly ten years earlier. Although it was in no way revolutionary, Ravel’s work proved to be too unorthodox to gain the approval of his elders, which actually counted against him when he applied for the Prix de Rome. Even Fauré criticised the last movement on the grounds that it was badly balanced. Debussy, on the other hand, was full of praise for his disciple and urged him “not to change a note of your quartet”. Like Debussy, Ravel adopted the cyclic form as established by César Franck, in which each movement takes up a new transformation of a germinal theme. The first movement is in traditional sonata form, but with a shift of emphasis in terms of tonality. For, in keeping with the modal character of the music, Ravel virtually abandons any progression towards the dominant key of C in favour of the closely-related minor keys of D and A. He extends this idea to the subsequent movements as well, and throughout the work it is the note A which has the greatest prominence, acting as a pivot between the major and minor modes. The second movement is marked ‘Tres rythmé’ (like the Debussy Quartet) and makes its effect with flying pizzicato figures and a strong rhythmic conflict between 6/8 and 3/4 metres. In the rhapsodic slow movement the note A pivots one step further: by switching enharmonically to B double flat it leads to G flat minor, which is then resolved into a rich G flat major for most of the movement. The finale, however, swiftly re-establishes the tonal centre on A, around which Ravel creates another rhythmic mosaic, this time juxtaposing quintuple and triple metres, and sweeps the music back towards F major for its exhilarating conclusion. The Coull Quartet was formed in 1974 by students at the Royal Academy of Music, under the guidance of the renowned quartet leader Sidney Griller. They rapidly achieved national recognition, and were appointed Quartet-in-Residence by the University of Warwick in 1977, a post which they still hold today. 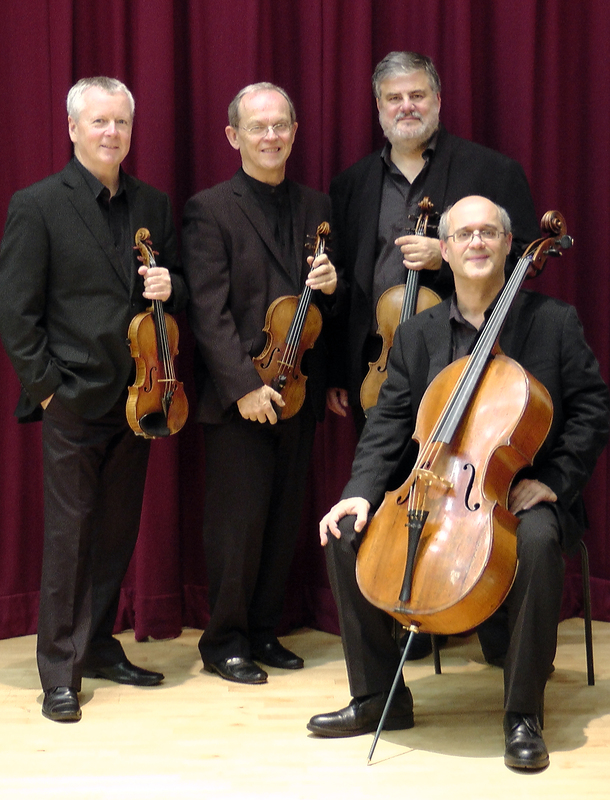 The Quartet, which includes two of its founder members, has performed and broadcast extensively throughout the UK, and has made many tours of Western Europe, the Americas, Australia, China, India and the Far East. Since the mid-1980s the Coull Quartet has made over 30 recordings featuring a wide selection of the repertoire closest to their hearts, from the complete Mendelssohn and Schubert quartets to 20th century and contemporary British chamber music. Their CD of quartets by Maw and Britten on the Somm label has received universal acclaim; in addition to being featured in ‘Editor’s Choice’ in The Gramophone, it was also described as the ‘Benchmark Recording’ by BBC Music Magazine. Their recordings of music by Sibelius and Ian Venables have also received excellent reviews in the major musical publications. An impressive and unusual list of commissions includes works by Sally Beamish, Edward Cowie, Joe Cutler, David Matthews, Nicholas Maw, Robert Simpson and Howard Skempton. These include string quartets, quintets with piano or wind instrument, works with solo voice or choir, and even a piece for quartet and table tennis players. The children’s cancer charity CLIC Sargent is the UK’s leading cancer charity for children and young people, and their families. CLIC Sargent provides clinical, practical, financial and emotional support to help them cope with cancer and get the most out of life. CLIC Sargent aims to help the whole family deal with the impact of cancer and its treatment. CLIC Sargent is active nationally, and locally in the Warwickshire and Coventry area. This entry was posted in cancer, Charity event, String quartet and tagged Coventry, Warwickshire, Worsted Weavers Guild on September 22, 2017 by worstedweavers. The internationally renowned Coull Quartet are to perform works by Brahms and Ravel on Thursday 21st September, 2017 in support of the children’s cancer charity CLIC Sargent at the 4th in a series of annual charity musical evenings organised by the Worsted Weavers Guild. This entry was posted in cancer, Charity event, history, String quartet and tagged architecture, Art, charity, children, CLIC-Sargent, concert, gardens, music, worsted weavers on March 30, 2017 by worstedweavers. The University of Warwick Chamber Choir performed at St James’ Church on the Packington Estate in support of children and young people with cancer at the third charitable musical evening organised by the Worsted Weavers’ Guild. The outstanding Chamber Choir, led by its Conductor Lucy Griffiths, performed Spiritual and Shakespeare song cycles and A Child of Our Time. The programme at St James’ Church on 20th July 2016 was enhanced by an impromptu series of solos and duets by scholarship students within the Choir. The performance was followed by a reception in the Pompeiian room at Packington Hall, with wine, soft drinks and canapes. Use of St James’ Church and the Pompeiian Hall was by kind permission of Lord and Lady Aylesford. CLIC Sargent Fundraising Manager Lydia Buckmaster said: “It’s great that the Worsted Weavers supported CLIC Sargent again with this fantastic event. Concert organiser and Past Master of the Worsted Weavers Guild of Coventry Donald Singer said: “The Guild supported CLIC Sargent for a 3rd year because of its excellent clinical and practical work, both nationally and locally, to help the whole family deal with the impact of cancer and its treatment on children and young people. St James’ Church is a red brick building with four domes topped by finials in neo-classical style. The church was built in 1789 to a design by architect Joseph Bonomi for the Earl of Aylesford as a private family chapel and to celebrate the return to sanity of King George III. Its design was inspired by the Baths of Diocletian in Rome. The church houses an organ built in 1749 by Thomas Parker to designs by Handel in 1749 for his librettist Charles Hennens, who was the cousin of the 4th Earl of Aylesford. There is evidence to suggest that Handel himself played the organ. The church does not belong to a parish – it is owned and maintained by the Aylesford family. The church is a Grade I listed building. The church’s architect Joseph Bonomi was born on 19th January 1739 in Rome. He was the first of five children born to Giovanni Giacomo Bonomi and his wife Teresa Corbi and was christened Giuseppe [portrait by John Francis Rigaud (see below) – Public Catalogue Foundation]. He was educated at the Collegio Romano and studied architecture with Girolamo Teodoloi, a nobleman and successful Roman Architect. Bomomi was clearly talented and impressed Robert and James Adam when they visited Rome. This resulted in an invitation for Bonomi to move to London in 1767. Joseph Bonomi worked as a draughtsman for the Adam brothers and later as an assistant to the Architect Thomas Leverton. In 1775 he married Rosa Florini a cousin of the painter Angelica Kauffman. In 1783 Angelica persuaded Bonomi to move back to Rome where she was then living but it was only a short stay and he returned to London in 1784 with his family, remaining there for the rest of his life. In 1784 his earliest known independent work was carried out. From this date he became a successful designer of country houses in England. In 1789 he was elected an associate of the Royal Academy with the help of his friend Joshua Reynolds, President of the Academy. He exhibited a number of perspective drawings at the Royal Academy exhibitions.He is also nationally known for the Pyramid Mausoleum at Bickling Park, Norfolk for the Earl of Buckinghamshire in 1794. In 1804 he was appointed Architect of St Peter’s Rome but this was probably an honorary post as no evidence has been found of him working there. In 1808 at the age of 69 he died in London and was buried in Marylebone Cemetery. His son Ignatius Bonomi also became a successful architect. His work in Warwickshire includes: • Design of the gallery at Packington Hall for the Earl of Aylesford in 1772. • St James Church in Packington Park for the Earl of Aylesford in 1789-92 • The redesign of Barrells Hall at Ullenhall for the Newton Family in 1792. The Pompeiian room, hall, music room, staircase, dining room, library and small dining room all have schemes designed by Bonomi. The music room originally housed the organ (now in the church) which was played by Handel. The Pompeian room was intended as a sculpture gallery but was remodelled by Bonomi as a setting for the Etruscan vases collected by the 4th Earl. The Roman wall paintings in the Pompeiian Room are by John Francis Rigaud, a history, portrait and decorative painter of French descent who studied painting in Florence and in Bologna. Rigaud was born in Turin, his father’s family having first fled from Lyon to Geneva after the revocation of the Edict of Nantes. Within a year of arriving to work in England, Rigaud was made a fellow of the Royal Academy and went on in London to decorate Somerset House, the Guildhall and Trinity House. His portraits included paintings of Sir Joshua Reynolds, Lord Nelson and St James’ Church architect John Bonomi. Rigaud was elected to the Royal Society in 1784. 2016 is the 300th anniversary of the birth of Lancelot ‘Capability’ Brown, the most influential English landscape gardener in history. “He changed the face of eighteenth century England, designing country estates and mansions, moving hills and making flowing lakes and serpentine rivers …” . As epitaph Horace Walpole wrote : “Brown shall enjoy unsullied fame For many a Paradise he regained” Brown is associated with more than 250 landscapes across England and Wales. He often described landscapes as having “great capabilities”, hence “Capability”. By using the sunken fence or ‘ha-ha’ he gave the illusion that discrete areas of parkland, though managed quite differently, were one. The 300 acres of magnificent parkland surrounding Packington Hall were landscaped by Capability Brown in 1751, at the height of his career, when in his mid-thirties. Packington Hall is one of a group of sites in Warwickshire at which Brown advised in the mid and late 18th century. These include Charlecote Park, Compton Verney, Combe Abbey, Newnham Paddox, and Warwick Castle. Lancelot Brown [portrait (in public domain) by Nathaniel Dance (later Sir Nathaniel Dance-Holland, Bt)] was baptised on 30th Aug 1716 at Kirkharle in Northumberland. He was the fifth of the six children of yeoman farmer William Brown, and Ursula who worked in the big house on the Kirkharle estate, where Brown began work as a gardener. It was while working at Stowe gardens that he first became responsible for executing architectural and landscaping works. While at Stowe, Brown also began working as an independent landscape designer, contractor and architect. In 1744, he married Bridget Wayet, with whom he went on to have 9 children. In autumn 1751, the year he worked on landscaping the Packington Estate, he was able to move with his family to Hammersmith in London. Brown offered a range of options to clients: a) for a round number of guineas, a survey and plans for buildings and landscape, leaving his client to do the work; b) a foreman to oversee the work, carried out by estate labour. c) overseeing and refining the work himself, by visits for a certain number of days each year. By 1753, he was employing four foremen and by the end of the decade he had over twenty foremen on his books. In 1764 he was appointed to the gardens of Hampton Court, Richmond and St James, allowing him to move home to live in style at Wilderness House, Hampton Court. Throughout his life, Brown suffered from asthma, the possible cause of his death in 1783. The children’s cancer charity CLIC Sargent is the UK’s leading cancer charity for children and young people, and their families. CLIC Sargent provides clinical, practical, financial and emotional support to help them cope with cancer and get the most out of life. Lydia Buckmaster, Fundraising Manager for CLIC Sargent for Herefordshire, Northamptonshire, Warwickshire and Worcestershire said: “ Last year CLIC Sargent helped to support over 1100 children and young people with cancer in the Midlands. It costs CLIC Sargent around £4,000 to support each child or young person through their cancer journey. To continue to do this we must raise a significant amount of money each year and we can currently only support 2 out of 3 of these children and young people.” “Today, 10 children and young people in the UK will hear the shocking news that they have cancer. Treatment normally starts immediately, is often given many miles from home and can last for up to three years. Being diagnosed with cancer is a frightening experience and the emotional, practical and financial implications of treatment are intensely challenging for the whole family.” CLIC Sargent is the UK’s leading charity for children and young people with cancer. CLIC Sargent’s mission is to change what it means to be diagnosed with cancer when you’re young. We believe that children and young people with cancer have the right to the best possible treatment, care, and support, throughout their cancer journey and beyond. And they deserve the best possible chance to make the most of their lives once cancer treatment has ended. CLIC Sargent provides vital emotional, practical and financial support to young cancer patients and families during and after treatment, and we take what they tell us about the impact of cancer on their lives to service providers and policy makers to help change things for the better. The history of merchant guilds in Coventry goes back at least to 1267. The original roles of the guilds included providing training for their professions and ensuring the quality of what was produced. The National Archives record a Company of Worsted Weavers, Coventry, from circa 1448; and a Company and Fellowship of Worsted Weavers and Silk Weavers, City of Coventry, from 1628. In 1703 the worsted weavers of Coventry, whose trade was then improving, were separated from the silk weavers to form their own company as a member of the guilds of the city. In modern times the Worsted Weavers and other guilds of the City of Coventry continue in a charitable role. This entry was posted in cancer, Charity event and tagged music on December 18, 2016 by worstedweavers. The distinguished University of Warwick Chamber Choir are to perform a programme of songs including Spiritual and Shakespeare Song Cycles and A Child of our Time on Wednesday 20th July, 2016 at the Packington Estate in North Warwickshire in support of the children’s cancer charity CLIC Sargent. This is the third in an annual series of charity musical evenings organised by the Worsted Weavers Guild of Coventry in support of this national charity, which supports children and their families in the Coventry and Warwickshire area. Warwickshire (~ 20 minutes north of Kenilworth). St James’ Church and Packington Hall are not normally open to the public. The neo-classical St James’ Church was inspired by the Baths of Diocletian in Rome and has an organ designed by Handel for his librettist, who was a cousin of the Earl of Aylesbury of the time, owner of the church and the Packington Estate. The performance will be followed by a reception in the Pompeiian Room at Packington Hall, with wine/soft drinks and canapés. TIckets for the concert and the reception are £35 per person. University of Warwick Chamber Choir performs in Warwickshire and further afield, with annual tour destinations including Spain, Germany, the Republic of Ireland, Belgium and Switzerland, as well as regular performances in London. UWCC have appeared on BBC national television in the Sainsbury’s Choir of the Year competition, live television in Greece, and on Central Television with Caliche with whom a CD of Ariel Ramirez’ Latin American Misa Criolla and Navidad Nuestra was recorded (the British première recording). UWCC’s wide ranging repertoire spans sacred, secular and folk music. The UWCC have premiered works by Howard Skempton and Michael Nyman and have commissioned new works from Joe Cutler and Jonathan Dove for 2015/16. The choir’s conductor Lucy Griffiths is the Assistant Director of Music at the University of Warwick. She studied for her undergraduate degree in Music at the University of Bristol, where she first discovered her passion for conducting. She went on to work as a lecturer in Music at Portsmouth University before being awarded the prestigious sinfonia ViVA conducting scholarship. This allowed her to complete her masters in conducting at Birmingham Conservatoire, where she was twice awarded the Sir Michael Beech conducting prize. This entry was posted in cancer, Charity event and tagged Chamber Choir on May 11, 2016 by worstedweavers. The internationally renowned Coull Quartet are to perform works by Hadyn and Debussy on Tuesday 15th September, 2015 in support of the children’s cancer charity CLIC Sargent at the second in a series of annual charity musical evenings organised by the Worsted Weavers Guild. The musical performance on 15th September 2015 will be in the Pompeiian Hall on the Packington Estate in Warwickshire (~ 20 minutes north of Kenilworth). Packington Hall is not normally open to the public. The performance will be followed by a reception on Packington Hall Terrace with wine/soft drinks and canapés. TIckets for the concert and the reception are £35 per person. This year the Coull Quartet celebrates its 40th anniversary. Formed in 1974 by students at the Royal Academy of Music under the guidance of renowned quartet leader, Sidney Griller, they rapidly achieved national recognition, and were appointed Quartet-in-Residence by the University of Warwick in 1977, a post which they still hold today. The Quartet, which includes two of its founder members, has performed and broadcast extensively throughout the UK, and has made tours of Western Europe, the Americas, Australia, China, India and the Far East. Since the mid-1980s the Coull Quartet has made over 30 recordings featuring a wide selection of the repertoire closest to their hearts, from the complete Mendelssohn and Schubert quartets to 20th century and contemporary British chamber music. Their CD of quartets by Maw and Britten on the Somm label has received universal acclaim; in addition to being featured in ‘Editor’s Choice’ in The Gramophone, it was also described as the ‘Benchmark Recording’ by BBC Music Magazine. Their recordings of music by Sibelius and Ian Venables have also received excellent reviews in the major musical publications. Their impressive and unusual list of commissions includes works by Sally Beamish, Edward Cowie, Joe Cutler, David Matthews, Nicholas Maw, and Robert Simpson. This entry was posted in cancer, Charity event, history, String quartet and tagged Arts, cancer, childhood cancer, CLIC-Sargent, Guild, worsted weavers on March 18, 2015 by worstedweavers.